Welcome to our site!! Come visit us on your next Vacation, You'll be glad you did!!! Western North Carolina is where you will find this new 2 level cedar-sided home, with 2 bedrooms, 2 full baths, 2 covered decks, stone fireplace, central heat & air, fully furnished just bring your family!! 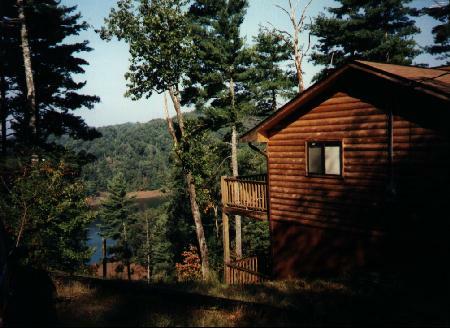 You will experience your vacation in a quiet and private setting, fishing, swimming, and boating area. Located on Lake Apalachia, near Murphy, North Carolina, giant trees, large waterfalls, and abundant wildlife surround the lake, with Blue-Ridged Mountains stretching to the horizon in every direction. You are minutes from North Georgia and Eastern Tennessee, a short distance from waterfalls, craft and antique shopping, White-Water Rafting Trips and an hour from the Great Smoky Mountain National Park!! All of this for only $650./week, or $130. per night-3 night minimum. Request Ralph's Apalachia Lake Retreat. Contact Adams Construction & Realty,Inc. 1728 Cherokee Mtn.Trail Murphy, NC 28906 or (828) 837-3946. The Place Where Fun things happen!! what a view this is!! !